Come home to this Vintage 1929 bungalow in Hampton Terrace section of Seminole Heights. New Roof 2018. New AC 2019. Expanded by the current owner in 2004, this 3/2 home offers a nearly 1800 sq. ft of living space. Step into the living room with the rebuilt fireplace as a focal point with period trim and picture molding. Needing a home office? This home features a sunny office nook to your left as you enter. The galley style kitchen features stainless appliances and has an informal dining area by the bay window. The huge family room is awesome for entertaining friends and family with room for a big screen to catch your favorite team play. Three spacious bedrooms. One of the unique features of this home is a central room that could be a play room, art studio space or even a formal dining room for those holiday gatherings. Double pane windows insulates against the Florida heat and outside noise. The flow of this home is flexible and adaptable depending on your needs and lifestyle. Inside utility, fenced back yard, large outside storage shed. Huge attic. Low maintenance stucco exterior. A convenient circular paver drive. Just blocks from Publix and numerous food and beverage venues. 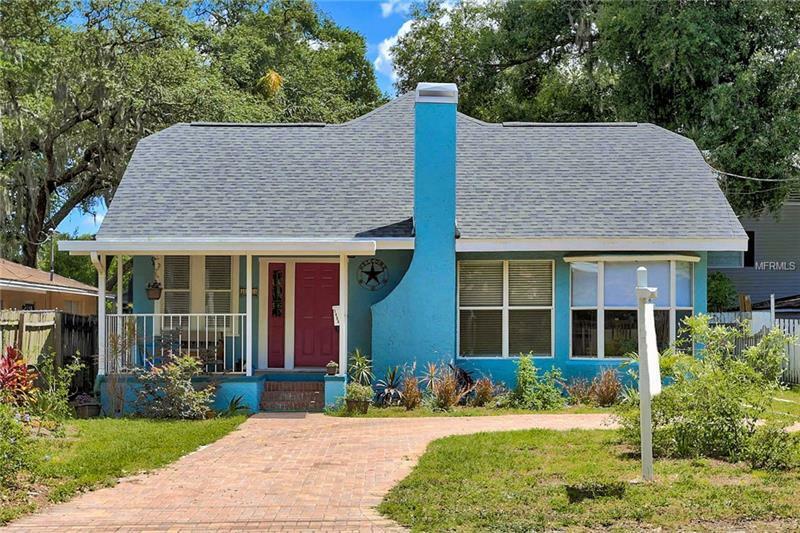 So much house for such a great price in one of Tampa’s most sought-after neighborhoods.